Well they do now Elizabeth! But I didn’t until a week ago on Saturday. I feel as if I’m a late comer to a party that everyone else has known about for AGES. So that day is marked in my diary as the day I discovered a dairy free chocolate mousse. I have a dairy thing – an allergy, an intolerance whatever you call it I have it and have had it since childhood – and that’s despite being brought up on raw milk. Goat’s milk, sheep’s milk you name it milk was tried but it wasn’t until adulthood and getting some testing that it was confirmed as a full on thingy with dairy/lactose. My way round it is generally to avoid the worst culprits – that means milk, cream and ice cream. They are no-gos for me. But there is a silver lining (there always is if you look for it); I do this so I can enjoy a few treats along the way – namely cheese. I couldn’t live life without cheese and let’s face it nor could I spend so much time in France if I didn’t eat cheese. The best approach I’ve developed is to completely avoid processed cheese and go for the full on un-pasteurised cheeses – in tiny oh so pleasurable doses. It’s all about balance. All this means that I rarely partake of desserts or puddings; custard I dream of you, but I avoid you, ice cream, I treat myself to a yearly flavour hit, crème Brulee – I love you but know you are wickedness personified. 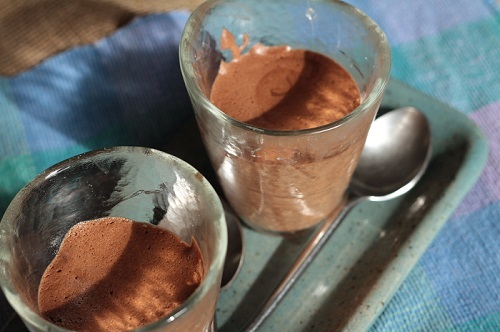 Dairy free mousse au chocolat is a delight – soft and velvety with a deep chocolate flavour and yet so light and fluffy. The recipe I asked? “Oh it’s simple, a bar of chocolate, 6 eggs (yolks added to chocolate, whites whipped up) and 2 spoons of sugar” came the reply. Well my French isn’t the best but I understood that! Back home, looking on line and double checking I find a great article in the Guardian where some kind soul tested out various versions – complicated, adding cream, alcohol you name it they tested. The verdict was that Elizabeth David’s was the best, the simplest and easiest and yes tastiest. But the one thing the author of the article and Mrs David’s missed out was the insider French information. The trick. The piece de resistance……. Leave it for 24 hours before you eat it. Can you manage that? I know it’s tricky, thinking of the dark-delight that sits in the fridge, winking at you every time you have to open the door for something else. But do what I did – make it, refrigerate it, leave it till morning when you have better light to photograph it and then have it with a cup of coffee for a late breakfast. Take 60g of dark (dairy free) chocolate and gently melt in a bowl over hot water, in the meantime in a separate bowl whip 2 egg whites (with a teaspoon of white sugar added) until they are firm, add the egg yolks to the chocolate and blend in, now fold the egg white mixture into the chocolate with a metal spoon. Leave it in the bowl or pour into small serving bowls / glasses and pop in the fridge – best left for 24 hours remember! Previous Post Previous post: Celeriac – the new black? Chocolate mousse is such a delectable dish. But I continue to have this guilt of adding both calories and cholesterol every time I look a mousse in the face! What could be the way out? my mouth is watering claire … if only there was some bitter chocolate in the pantry …. but there will be tomorrow … i have dairy problems too so this recipe looks like a dream! I think this can be adapted using sugar-free chocolate for my husband! Thanks, Claire! Chocolate mousse for breakfast! Someone knows how to live! BTW, love your header picture–a perfect breath of spring (while we live through record late cold and snow 😦 ). It was more brunch your honour, honest!! And thank you, so pleased you like the iris – it’s the first to flower (the crocus have now died back), and today we have had our first sunshine in weeks. Phew! Happy Chocolate Easter to You and your family. Where this is a will, there is a way and it sounds like you found a good one. So true Karen, there are times I have to avoid dairy altogether, but fortunately they don’t last very long. So it’s been a delight to find such a quick and simple desert to make, I don’t need to worry or think about dairy. I have a friend whose chocolate tolerance is limited to the cocoa powder version rather than anything with cocoa butter in it. Adjustments get made and substitutions found. I think it’s great that we can think around things and work out alternatives, like your friend, and with the internet ideas are literally a few seconds away! especially for us no-dairy folks!! Claire, thanks so much for a lactose free beauty. Something Dear Husband loves. I added finely chopped chocolate bits at the last minute to give it a gritty texture and he went ga-ga! Happy Easter! This sounds so simple to make…and just wonderful! Thank you, Claire! If I get stuck hosting Easter dinner this year.. I’ll be making these!! How simple and delightful are these! I love your little glasses as well, it just makes the photograph perfect! 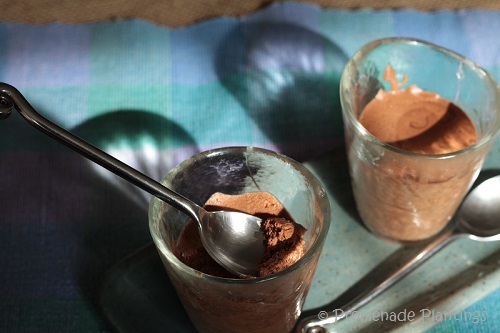 Dairy chocolate mousse, non-dairy chocolate mousse, I will eat either if put before me. I think I’m the opposite – I can have chocolate in the house for months, half-eaten packets in the cupboards, i’s all there! Savoury things are lethal to me – crisps and nuts arggghhh! Heavens – chocolate mousse for breakfast! I think if I had this in my fridge it would get me out of bed tomorrow morning! LOL! LOL that is a definite inducement Cathy! Fantastic recipe! 🙂 I’m no lactose intolerant, but I’m willing to try this version…simply delicious! Thank you Kathryn for reminding me, I remember you writing about using coconut milk and how good it is, but I’d forgotten. Consider that remedied! And yes of course I use it in curries, but haven’t extended it to sweet treats. as I say consider that a done deal 🙂 Happy days! Chocolate mousse for breakfast, how wonderful! Sounds wonderful – and easier than the milk/geletine/etc. kind! Ah, chocolate mousse….makes me close my eyes and imagine a taste. You know, as much as I enjoy it somewhere else, I’ve never made it. I guess that’s why it always seems so special. Hi Lynda, an “overabundance of eggs” sounds like a great reason (not excuse!!) to make this treat. Thank you I seem to crave chocolate lots of times…this one seems light and airy. It is very light and airy Linda, and if you like bitter you can omit the sugar (or reduce it). C’est l’extase et l’agonie de la mousse de chocolat. Bien fait, Claire. Afternoon John, or should I say bon app 🙂 I think you’d like this one, nice and simple, quick and easy and yeah tasty too ! So chocolate mousse is nourishing too!!! Sorry about the allergy…but sounds like you have found a wonderful way round it! I’m not a big chocolate fan, but every so often I have a craving and this is exactly what would eat! I learnt two new things, one you can make a dairy free mousse and two you need to leave it for a day to make it better, thank you! Can you use lactose free milk? 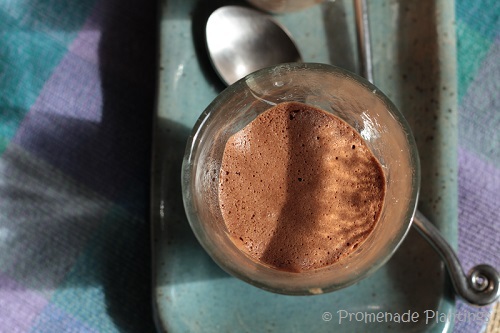 A new chocolate mousse recipe to try – bliss! I was interested to see that Elizabeth David did not include sugar – or was that quote incomplete? Congratulations… So good you found a recipe you could enjoy!